PSI 2018 took place from 9 to 11 January in Düsseldorf, Germany. This year the event included 925 exhibitors from 37 countries (2017: 988) and attracted 17,342 visitors (2017: 18,094). Among them were 1,200 industry customers who were invited by a distributor and had an opportunity to attend PSI on the last day of the event. Some 58 percent of visitors travelled from outside Germany, one in seven of them from overseas. 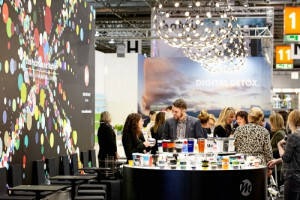 The visitors and exhibitors represented as many as 90 countries this year, which is a record. This year PSI again welcomed some new exhibitors. 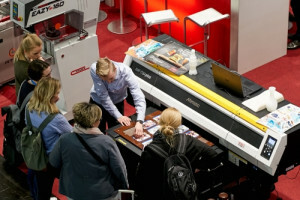 Epilog Laser was exhibiting for the first time at the show. “Because we established a new European head office in The Netherlands with Epilog Lasers in stock, we decided to participate as an exhibitor at this year’s show and we invited our distributors to join our stand and show customers their products,” says Emma Oltmans, Marketing Manager EMEA at Epilog Laser B.V. She is satisfied with the first-time appearance. Another new exhibitor this year was Madeira Garnfabrik. “This first year as exhibitor is a trial for us,” says Jens Zeuke, Area Sales Manager of Madeira. 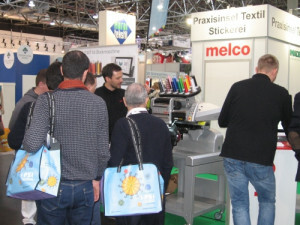 “Because next year’s PSI show will be held at the same time as Viscom, we will exhibit then again.” Madeira demonstrated their new products on the new Melco EMT 16 embroidery machine. On display was the new polyamide HC thread for e-textiles and LED applications, and the frosted Matt threads, now also available on 1,000 m mini snap cones. Melco International returned to the PSI show after a hiatus of five years. 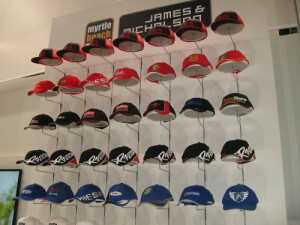 As usual, all members of the Choice Group were exhibiting in Hall 12. “PSI is still the most important trade show, the place where the entire industry gets together. Everyone is here, including the international market players. The atmosphere is excellent. The date at the beginning of the year is a particularly great choice, because this is the time when everyone is thinking of the future and kicking off the year with new ideas,” says Kai Gminder, Managing Director, Gustav Daiber GmbH. “We are currently seeing something in many areas that might best be described as an analogue or haptic revolution. These days, in the age of digital reproducibility and arbitrariness, people are looking for things they can experience in tangible and multisensory ways. 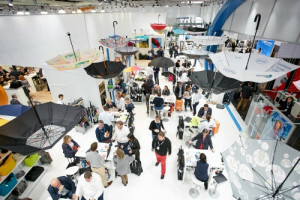 This is a megatrend which of course has a positive impact on the promotional products industry,” said PSI director Michael Freter at the conclusion of the three-day promotional products industry exhibition. “There’s an unmistakable trend towards sustainability and highquality products,” says Michael Freter. The latest PSI Industry Barometer underscores this statement. It found that more than 90 percent of the surveyed promotional products suppliers and distributors now have certified or verifiably sustainable products in their assortments. For more than half of the suppliers and distributors, the share of sustainable products even exceeds 30 percent of their complete range. Staging promotional products as lifestyle products – that’s what defines the nature of PSI. Be it on the PSI Catwalk, in the GustoPavillon or with many surprising product ideas and innovations at the stands. For example a singing bottle opener in the shape of a mini football that intones Word Cup fan chants or an umbrella that changes colour depending on the amount of rainfall, finding the good even in the dreariest weather, or a drinking bottle made of silicone that can be shrunk down to pocket size when empty. All these examples drive home the point PSI director Petra Lassahn is making when she says, “Where our power to imagine the diversity of promotional products ends, the PSI Show begins”. You can read more information about PSI 2018 and watch the photo gallery.